This protein-rich meal is full of colour and flavour. Perfect to take on a picnic! 1. Cook the sweet potato in a pan of boiling water for eight minutes until just tender. Drain. 2. Heat half the oil in a frying pan and cook the onion with the sweet potato and red peppers for five to six minutes. Add the peas and cook for one minute more. 3. Beat the eggs in a large bowl, pour in the vegetables and mix well. Season and stir in the herbs. 4. Heat the remaining oil in the same frying pan and pour the egg and vegetables back into the pan. 5. 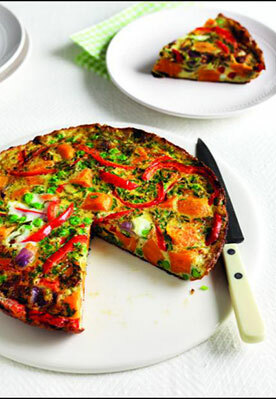 Cook over a low heat for 15-18 minutes, until the bottom of the frittata is golden. Meanwhile, preheat the grill to hot. 6. Finish cooking under the grill for six to eight minutes, until golden on top. 7. Leave the frittata to stand for a minute, then run a knife around the edge of the pan, place a plate or board on top and turn over to remove from the pan. 8. Cut into wedges to serve hot or cold.